COURSE FEE: As everyone’s requirements vary Please Enquire to discuss what yours are. What a wonderful concept, buying a yacht, stepping off the treadmill, and seeing the world through the relaxed eyes of a Cruising Sailor. It is possible, and many have attempted it; some successfully, and some not so successfully. However, we can all get carried away with our dreams and overlook the fundamental question: “How we are actually going to realise the dream, and sustain it”? Ensure your budget not only covers the capital, and purchasing costs of your yacht, but still leaves sufficient funds for running costs in the absence of a regular income. Thoroughly research the type of yacht you will need in terms of accommodation, maintenance costs, ease of handling, and sea worthiness in intended cruising areas. There are many more factors too numerous to mention here. Make sure you are completely familiar with your final choice of yacht in terms of systems, handling, engineering, and maintenance. Steps 1 & 2 are largely a matter of personal circumstances and preference. Step 3 is where “Own Yacht Tuition” comes in. We offer all our RYA Practical courses aboard your own yacht providing it conforms to the RYA Boat Safety Handbook, and our Instructors are satisfied that it does, and that it is sea worthy. 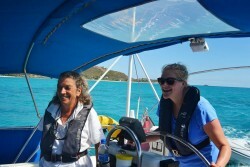 You can either bring your yacht to our base in Jolly Harbour, Antigua, or our Instructor will travel to your location. 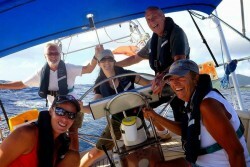 Course costs will depend on the number of students on board, but will include all relevant RYA Course Notes. Instructor travel & subsistence costs are not included. Examinations can also be conducted on your own yacht providing there are sufficient crew to manage the yacht during examination.